Once we’d found our optimum seating positions (there isn’t one for tall people like me! ), we in typically British fashion stuck to our own seats pretty much. On the back row was Amanda, Mark, Mick and me. Moving forward we had Trudi, Ian and Lynne, then Karen, Paul and Nicki, then Dean, Sarah and Jacquie. Dean and Stu were up in the cab – and since they were sharing the driving obviously did swap seats a number of times. And so we embarked on what would be in excess of 1,200 miles and well north of 20 hours on the road (or in a tunnel). Dean took the first driving stint, we largely messed around or slept (I am quite adept at sleeping in strange places!). The channel tunnel is worth a mention – I’d never travelled on it before, what an engineering marvel – although it’s hard not to feel disconfited with the plethora of fences, razor wire and other unwelcoming sights – that said, gaining access to our train didn’t seem to difficult, passports were passed out the window and we didn’t even need to get off the minibus (although we did whilst waiting for our train to be called for a leg stretch). In the carriage itself it was pretty spartan, and Ian pouring some cider out did worry Amanda a lot as all she could imagine was the sound of running water! It certainly doesn’t take long to get through – and soon enough we’re bombing through France on the way to Belgium, by this point Stu is driving, and seamlessly switched to the other side of the road. The one tiny drawback of this kind of trip is that sightseeing is fleeting – my overriding impressions of Belgium were shuttered windows and high-up toilets (which are GREAT for tall folk!). 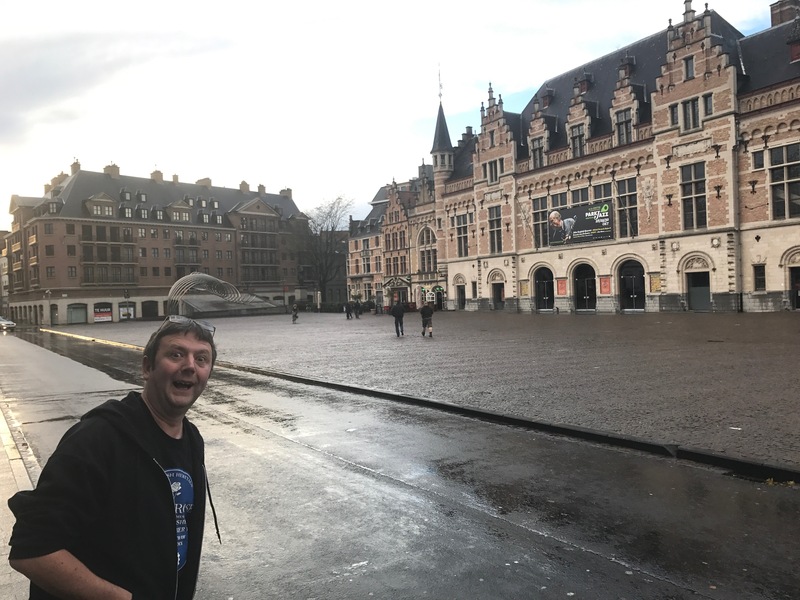 Our hotel was centrally located – and really nice, I roomed with Mick and we got ourselves sorted out and settled in before hitting beautiful down town Kortrijk in search of sustenance. It would seem that early afternoon on a Friday is not an ideal one for such a mission – eventually we ended up in a not particularly traditional bar called Shooters with pool tables, we got ‘the look’ from the barman but were firm mates by the end of our visit – certainly we didn’t have a traditional experience, but we drank lots of beer and he even let us get some pizzas from Domino’s next door to eat in the bar! You know you’re on the right track when the jukebox starts playing Levellers unbidden by us! Steve had met us in the bar too and soon enough whilst perhaps not seeing much of what was a very pretty looking place, we’d certainly had a great afternoon and early evening capped off by locals taking photos with us and promising to check out Ferocious Dog (we were making sure we were wearing FD t-shirts for much of the weekend, being the primary focus of our touring with the not inconsiderable bonus of a bit of Levelling thrown into the bargain!). De Kreun in Kortrijk is a lovely little venue, compact with a bar at the back and a barrier – Dom was setting up on stage, we amused ourselves by adding our signatures to the set list nearest to us (sorry Belgian person who picked that up, haha, it might be worth something one day! 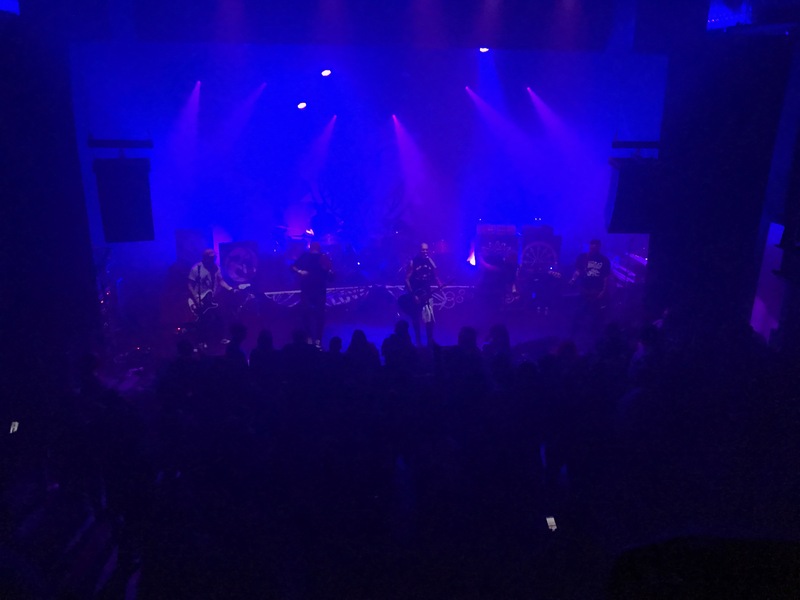 ), I popped up to the balcony to grab some photos of Ferocious Dog on the stage before hot-footing it down to the mosh pit, handing my breakables to Leanne en route (no hoody this time, instead I’d been freezing myself in shorts at t-shirt, oops!). After the intro music a healthy crowd were in (this was a sold out night, although much of the crowd would arrive later) the band kicked in with Gallows Justice before A Verse for Lee, The Glass and Lee’s Tune. I know how much they’d agonised over such a short set list. The travelling fans went for it with gusto, the rest of the crowd were pretty captivated and moving around too, perhaps not quite so boisteriously! Unconditional was up next, and then Too Late saw the customary triple-stack of Dean holding up Paul and Nicki. That certainly got the locals attention! Lyla saw Deano hefted by Stu, and Slow Motion Suicide had plenty of folk up on shoulders too – certainly Mick, I think it was that one I picked up Mark for and there’d have been others too! All that remained was a three-song tear-up to Hell Hounds, Freethinker and Mairi’s Wedding Part 2 (where I found myself up in the air on Dave’s shoulders – to think he’s just had a knee op, silly man!). I’ve a vague memory of hefting a walking stick around somebody passed up to me too. Ah, the silliness! Before Levellers were due on we had time to nip back to merch to natter and watch more folk streaming into the venue, they missed out! There was time for drinks and for Scott to gallantly loan me his vintage Adidas tracksuit top (I’m properly honoured mate!) as he was worried about how frozen I’d be later. 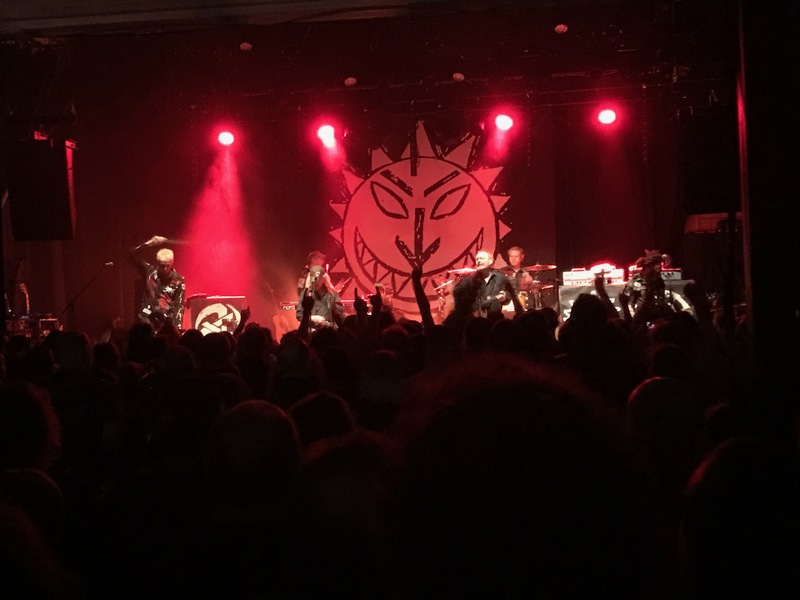 I watched the Levellers set from the back in the now jam-packed venue – knackered from the journey and the exhuberance of the Ferocious Dog mosh. Mark and Amanda were with me, we’d half thought about heading to the hotel but were drawn in by the set really. Mick was with us too before being inexorably drawn back to the mosh pit – soon enough we saw him up on shoulders and carrying Paul around too! The first part of the set list was always going to be easy to predict – they played Levelling the Land in full. It’s a timeless album – as relevant today as it was when it was written – One Way, The Game, Fifteen years, The Boatman, Liberty, Far From Home, Sell Out, Another Man’s Cause, The Road, Riverflow and Battle of the Beanfield – how could you realistically walk out during any of those no matter how tired you are? 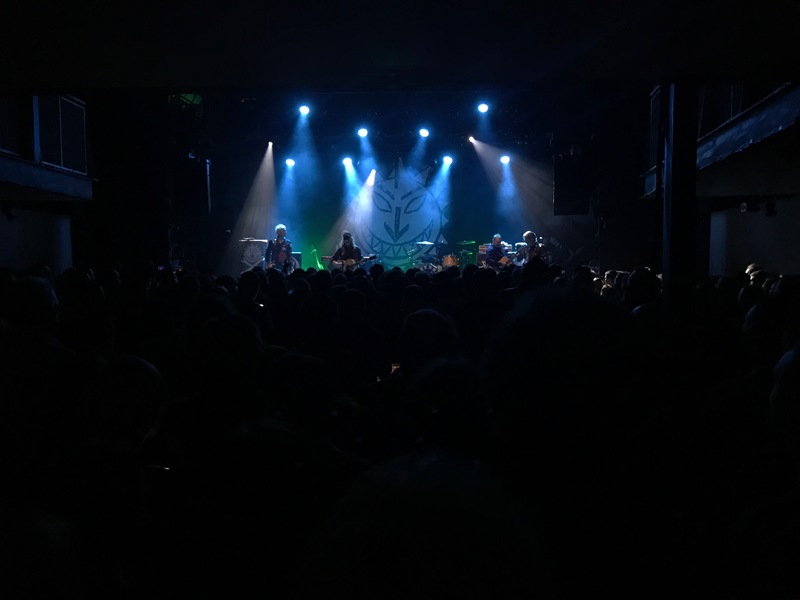 We did retreat slightly as the post-LTL songs kicked in to loiter by the merch desk – the sound was still really good out there, and it gave us a chance to catch up with folk and hand out flyers to locals or get them signed up to the mailing list. This Garden boomed out whilst Mark was volunteering to take a photo for a local couple with Ken (and nearly dropping the poor guy’s phone in the process! ), Belaruse, Truth Is and Cholera Well finished up the Levellers set proper before they went off and were called back for an encore by an enthusiastic crowd. They came back out for Beautiful Day and What You Know – they were on superb form, but as we opined later, I’m sure they’re playing their songs a little slower than they used to – or maybe it’s just the contrast to the frenetic pace of Ferocious Dog. Under protest from a number of us they promised to add in Freeborn John for subsequent shows having erred on the side of caution with their set list and only clocking it in at 40 minutes, leaving them five more to play with – so that was something to look forward to the next day in Germany! Back at our hotel we had a few drinks in the bar, admiring the procession of dogs who were brought in there with nobody batting an eyelid. There was a dog show nearby, but even so – dogs in a hotel, it wouldn’t happen in England and we call ourselves a nation of dog lovers! One of the organisers of the show bought Stu’s newly acquired Ferocious Dog t-shirt from him, all in all, we found the Belgian folk we met to be wonderfully laid back and friendly people. And it was with that warm and fuzzy feeling it was definitely time to go and get some overdue sleep!